Forced warm air convection is very useful on a boat. The system does much to give rapid heat to cabins and combat condensation. The air system is compact with all heat creation and fan distribution neatly packaged in one heater unit. This, when installed in a locker or engine area, suits the concept and layout of boats. The system is very easy to fit. Particularly the specially packaged DIY kits, which are ideal for weekend owner fitting or boatyard installation. A fitted Eberspächer system will enhance the value of the boat in offering; at a sensible price, a full boat ducted system. An air system offers some interesting benefits such as hair drying, toilet area heating and hanging locker drying. These all form a part of the basic hot air ducted system. When heating is called for by the cabin temperature sensor or the pre-select programmer, the heaters fan draws combustion air into the heat exchanger. Simultaneously fuel is drawn from the boats main fuel tank by the heaters fuel pump and mixed with the air. As the ignition pin ignites this fuel / air mixture, a controlled flame is established inside the sealed heat exchanger. The combustion gasses pass safely out through the exhaust skin fitting to the atmosphere. Clean air is drawn over the walls of the heat exchanger and into the duct system. This will have been fitted to distribute the heat appropriate to the needs of each cabin. It is possible to have adjustable outlets to fine tune the air flow. The system is monitored for a safe start, available battery power, flame failure and overheating. Most models within the range are now controlled with a rheostat switch and cabin temperature sensor which accurately interacts with the temperature setting to self regulate the heater. The heater therefore regulates the heat output to maintain maximum efficiency. This temperature control is more accurate than the previously used thermostatic system. In doing so, greater fuel economy and substantially reduced power consumption are achieved. The hot air systems are available in a fully comprehensive DIY kit form. Each kit comes complete with a comprehensive instruction manual to ensure installation is as simple and straight forward as possible and, for further reassurance of quality, is backed by a full 12 months parts and labour warranty and a nationwide dealer network. Airtronic D2 self regulating air heater with electronic controls. Long life ignition pin  used only once per heating period for initial starting. All electrical looms and connections. 2 metre insulated exhaust system. Fuel system complete with fuel metering pump. Stainless steel heater mounting bracket. Stainless steel exhaust skin fitting. 4.5 metres of 60mm flexible ducting. Air entry and air outlet grills. All necessary clips and screws. 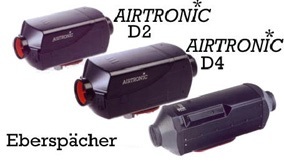 Airtronic D4 air heater with electronic controls. 5 metres of 90mm flexible ducting. 2 metres of 75mm flexible ducting.